Working with the US Department of Veterans Affairs, Apple announced that the Health Records on iPhone feature will be available soon to veterans. Veterans across the US will be able to see medical information from participating institutions — including the VA — organized into one view all in the Health app. VA patients will get a single, integrated snapshot of their health profile including information on allergies, conditions, immunizations, lab results, medications, procedures and vitals, and is displayed along with other information in the Health app like Apple Watch data. Apple says that Health Records on iPhone will be the first record-sharing platform of its kind available to the VA. The VA is the largest medical system in the United States, providing service to more than 9 million veterans across 1,243 facilities. Discussion that the feature was coming to veterans surfaced in November 2018. 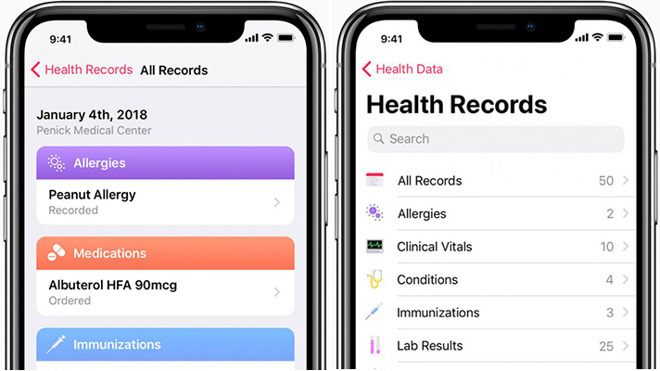 Debuted with iOS 11.3 in March, Health Records aggregates and stores encrypted patient data in the iOS Health app, effectively making that information portable and immediately accessible to end users. With Health Records, users are able to quickly review medical records and other pertinent information with doctors and caregivers, bypassing backend hurdles that can bog down access to treatment. Apple launched Health Records with support from 39 health groups, with another 36 backing the technology in August. While a handful of larger regional groups integrated with the portability program, major nationwide networks are still out of the loop.